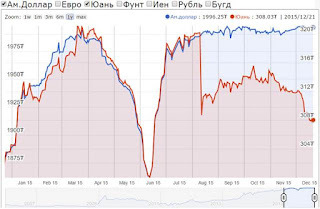 December 21 (MSE) Mongolian Stock Exchange organized 5 securities trading sessions and made transaction of MNT10.9 billion with daily average transaction of MNT2,184,650,291.60 in period between 14 December 2015 and 18 December 2015. 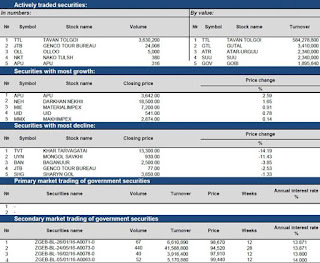 5,570,687.00 shares of 35 joint stock companies worth of MNT609,730,038.00 were traded. 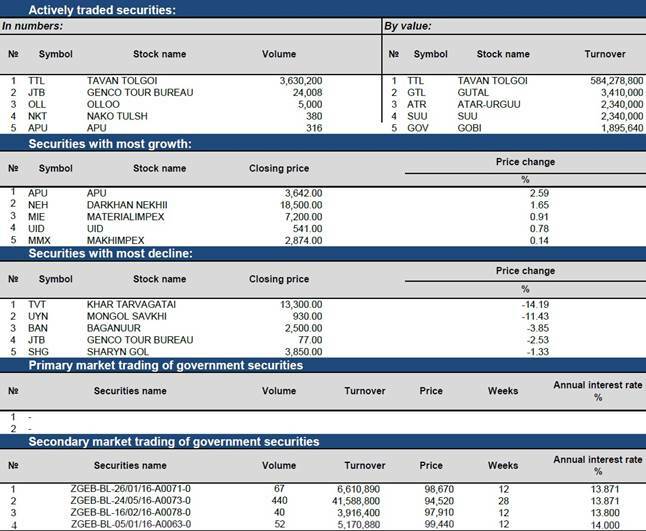 1,650 government retail bonds traded on secondary market of Government securities trading and total of 313,521,420.00 transaction has been made. As of 18 December 2015, market capitalization was MNT1,226,863,471,247.53 which indicated increased of 0.44% and MSE ALL index reached 870.53 units which indicated increased of 0.45% from the previous week. December 21 (news.mn) Since 11th November 2015, Mongolia has been exporting hay to China, via the Bichigt-Zuunhatavch border-crossing. As of today, Mongolia has exported 3,394.13 tons of hay with 111 trucks. An Inner Mongolian information site has noted that: The hay deliveries are the result of a memorandum between Mongolia and China, which was signed in July 2015. China has a shortage of organic nutrition for livestock; the supply of Mongolian hay represents a positive step in solving this. The Quarantine and Custom offices in the Inner Mongolian city of Huhhot have approved the quantities and supplied the required standards for the import of hay". December 21 (news.mn) During "Ministers' Hour" program, Mining Minister R.Jigjid along with the CEO of "Erdenes Mongol", B.Byambasaikhan, and the CEO of the "Erdenes Oyu-Tolgoi" company Da.Ganbold answered some questions from the media. -The investment contract of Oyu-Tolgoi underground mining has been signed. Will the dollar rate be reduced, as a result of investment? R.Jigjid: In 2009-2014, USD 7.9 billion was invested to the Oyu-Tolgoi, and USD 2 billion was traded. Also, Oyu-Tolgoi has generated USD 1.3 billion in tax for the state budget. The contract which has been signed approves investment of USD 4.4 billion. 80% of the gold and copper will be extracted from the underground mine. B.Byambasaikhan: The construction works of the Oyu –Tolgoi underground mine requires USD 6-7 billion. The financing will come to Mongolia after the beginning of 2016. -Mongolia owns 34% of Oyu-Tolgoi. When will Mongolia obtain the benefits? 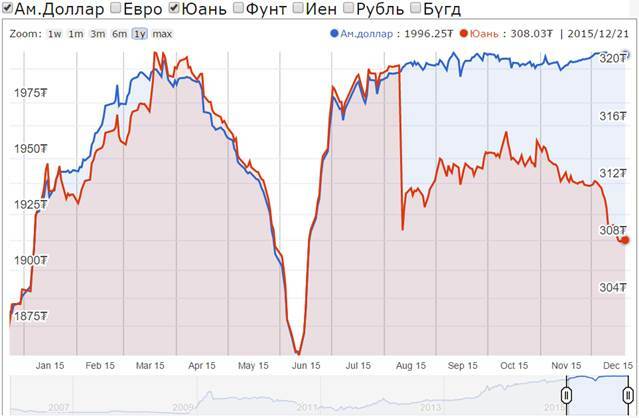 Also, the Mongolian government debt seems like it is becoming endless. -6400 Mongolian employees work at Oyu-Tolgoi. No project yields short time benefit. Money doesn't just rain. In a developing country, like Mongolia, the benefits of big projects are noticed progressively. The copper price will stabilize in 2017-2018. The price of the metal, which was USD 10,000, currently stands at USD 4685. The copper price is falling gradually. Of course, the price will never reach a zero US dollar rate. How much do people around the world need copper? It is just a cycle of growth and decline. Therefore, the copper price will increase again in 2018. December 21 (UB Post) A total of 6.1 trillion MNT in unreported, equivalent to 27.9 percent of 2014 GDP, has been unveiled and declared since the economic transparency law went in force, Prime Minister Ch.Saikhanbileg announced during the delivery of a report on the performance economic transparency law given at last Friday's joint parliamentary meeting. "The government is taking measures in four basic directions in order to implement the ated to providing citizens with information related to laws, is now in operation to improve communication with individuals anlaw on economic transparency, which will allow a one-time exemption from legal liability for an individual or a legal body which has declared their concealed and unregistered assets and income on their own," said the Prime Minister, mentioning that the website iltod.mta.mn, dedicd entities. According to the report presented, under the economic transparency law some 1.2 trillion MNT (taxes equivalent to 18.8 percent of 2014's tax income) and undue losses of 362.1 billion MNT have been exempted from interest payment. The Prime Minister emphasized, "This proves that implementation of the economic transparency law has become a great form of state support to business owners, and shapes a pleasant environment for domestic investors and businesspeople to proceed with their operations sustainably." He said that many requests are being submitted by individuals and entities to extend the law's deadines, as they say it takes a lot of work and time to organize documents and the timeframe of the law is really short. "The economic transparency law expires on December 31, 2015. Therefore, the Cabinet will work hard in the remaining days to intensify implementation of the law, giving every individual and legal entity an understanding of tax laws and create opportunities to use the chance for a one-time exemption allowed by the law," noted Ch.Saikhanbileg. Ulaanbaatar, December 21 (MONTSAME) Women MPs D.Oyunkhorol, L.Erdenechimeg and G.Uyanga Monday reported that they decided to pass a demand to the Prime Minister for an attention to the health sector of Mongolia by promptly appointing the Minister of Health and Sport. "Influenza is high among people in this cold season, and we worry that a position of the Ministry of Health is still absent. The health sphere is really needs a good management," D.Oyunkhorol stressed. "We have decided to convey an official note to the Premier on a quick appointment of the Minister so that he or she focus on the matter. The same note will be sent to the Speaker as well. Due to the absence of the Minister, medical doctors and staffers' conditions are worsening," she said. "Women MPs have been collaborating in health, education, children, elders and women matters since we were elected as such. We have worked over several bills on the health sector and have paid a great attention to its budget. We have also made efforts to place money in the budget for constructing a building of the city's 3rd maternity house," L.Erdenechimeg said, and added they wish the Minister of Health and Sport is appointed as soon as possible without any political matters. The health sector must not be ignored, G.Uyanga MP said. "Medical doctors and experts also have to pay attention to the appointment of a new Minister". "Just because of absence of the Minister, both health sector workers and patients must not suffer problems caused by nowadays condition," she added. December 21 (December 21) In the first week of December, 2015, a parliamentary delegation from Ulaanbaatar, Mongolia, visited Poland in order to learn from this country's experience in reforming its social insurance system. Despite the vast distance between Poland and Mongolia, the two countries actually share many similarities. Mongolia, like Poland, had a centrally planned economy and an extensive social protection system for many years. Both countries faced the challenges posed by a legacy of financial obligations following the liberalization of a once centrally planned economy. The populations of both countries are also both ageing - which raises enormous challenges for achieving fiscally affordable - yet adequate - pension and social insurance systems. One of the World Bank's mandates is to facilitate international contacts and enable an exchange of experiences. In 1999, both countries conducted fundamental reforms, moving from defined benefit system to defined contribution schemes, meaning that a direct link between contributions and pension benefits was introduced. "We see a role for the World Bank to support an evidence-based approach in decision-making. Linking country policymakers with comparable experiences is a useful means of considering design options and parameters for adequate and sustainable pensions, for example," says Mark Dorfman, World Bank Senior Economist and organizer of the visit by the Mongolian delegation in Poland. "Through a carefully designed study-tour, our counterparts learn not only the results of reform efforts but the impressions of those who implemented these specific reforms," he added. One contrast between reforms in these countries came in the realm of communications. While Poland made a substantial effort to communicate with the public about the nature of the reforms and substantially increase the transparency of the benefits for contributors, Mongolia did not - creating confusion over the objectives of these reforms and the mechanics of notional accounts. "The reforms in Poland were accompanied by a broad information campaign and social consultations. As a result, Poland may be seen as a country whose experience can be an inspiration to others," says Marina Wes, World Bank Country Manager for Poland. The Mongolian delegation expressed its satisfaction with this learning experience. In particular, they noted a sharpened view of the key tradeoffs, risks, and enabling conditions needed to support a funded pension scheme in Mongolia. Furthermore, they now have a better idea of the institutional and communication requirements needed to support a defined-contribution scheme, following this exchanges. They also took away ideas about how to approach a raise in the retirement age, including for special groups of workers subject to early retirement. Finally, the also noted their appreciation for learning from Poland's experience with Farmer Pensions, including some of the potential risks and costs associated with the establishment of a subsidized program for similar kinds of beneficiaries in Mongolia. Much can be learned from Poland's experience over the last 25 years of transformation in areas such as social insurance reform. Currently, experts from the World Bank are working on a report, titled "Lessons learnt from Poland," which summarizes the most important structural reforms in Poland, starting from the systemic transformation in 1989. The objective of the report is to assess Poland's achievements and to draw lessons for other countries undergoing their own structural reforms. The report also aims to identify a policy reform agenda for Poland that can help the country converge to development level of Germany, Finland, and Australia, for instance. In 2013-2014, the World Bank office in Poland also conducted the "Poland as Global Development Partner" project. Within the framework of this project, the Bank organized debates and conferences on key development topics, initiated a knowledge exchange between Poland and a number of other countries, and prepared a number of publications summarizing Poland's accomplishments over the past quarter of a century. December 21 (gogo.mn) A snow-capped, gallant blue mountain stands approximately 100 kilometres to the southwest of Tokyo. This is the 3,775 metre high, beautiful Mount Fuji – a unique symbol of Japan and the highly respected and beloved mountain of the Japanese people. A view from the peak of Mount Fuji lets you see the Land of the Rising Sun and its five islands stretching hundreds of miles in the blue waters of the vast Pacific. Similarly to the way Japanese people address each other with respect, they also call the mountain 'Fuji-san'. It is said that every Japanese person dreams of visiting the mountain at least once in their lifetime, to pay their respect, express gratitude, and refresh their souls. The Japanese have a tradition of sending a letter of gratitude to each other, to their parents, friends, colleagues, and business partners on New Year's Day. It is significantly valued, especially if the postcard comes from the post office elevated highest in the country and has a picture of Fuji-san. Through this letter I would like to tell you about an event that relates to Mongolia, and is taking place in the capital city of the second richest country in the world, atop Mount Fuji. A Japanese advisory firm named Frontier organises the "Invest Mongolia" conference every year. This year, it took place in Japan. The third annual conference saw an attendance of almost 400 participants, 80 percent of which were Japanese. At the beginning of the conference, only four or five people raised their hand when asked whether they had visited Mongolia before. If not the largest companies, Japan's smaller businesses have already invested in Mongolia and started their operations. Therefore, they pay close attention to what is happening in Mongolia. Many people noted that Japan-Mongolia political relations are going very well. Under the comprehensive partnership, Mongolia and Japan have been working together effectively and organising state visits with each other. Mongolia is one of the few countries that has established an Economic Partnership Agreement with Japan. The maturities of democracy, organisation of elections, and change of government have become common phenomenon for Mongolia. Even though there are issues and problems, we are a country that is solving them as we face difficulties. There is a lot of progress in Mongolia. First of all, the second phase of the Oyu Tolgoi project has commenced. In a few days, more than ten international banks will sign a $4.4 billion dollar project financing package with Oyu Tolgoi (it was signed December 15-16). A large Canadian bank is also investing in Xacbank. In two years' time, Ulaanbaatar's new airport will be commissioned and is going to be managed by the Japanese. The airport will also be used by Japanese aviation companies and be turned into a large regional hub where flights are always on time. Furthermore, the Japanese are building a hospital in Ulaanbaatar to be used by the Mongolian National University of Medical Sciences. Japanese STANDARDS of industry and services are impacting many areas in our country, which is likely to bring quality improvement and enhance competitiveness. In addition, the cultural and educational relations of the two nations have been developing rapidly resulting in thousands of Mongolian students studying in Japan and an increased exchange of visitors. During the conference, it was also emphasised that some of the construction workforce for the Tokyo 2020 Olympic Games would be sourced from Mongolia. However, there is a lot of room for improvement. In Mongolia's banking sector, 14.7 percent of total loans are bad loans due to the fact that approximately 7 percent are unprofitable loans and 7.4 percent are expired loans. A representative from Moody's, which has recently downgraded Mongolia's credit ratings, said that, if the Oyu Tolgoi project finance was to be delayed for any reason, the credit ratings would be lowered further. Sales overall have slowed down, whilst the capital market has become idle. However, things are unlikely to be shaken since Mongolian banks have learned to better manage their collateral capital. Even though industry and services have centralised in Ulaanbaatar, we are lacking a free economic zone. COMMODITY PRICES are falling, public expenditures are shrinking, and its deficit is rising. Also, the granting of loans has decreased. A representative from the International Monetary Fund noted that, instead of accumulating, Mongolia acquired foreign loans and increased its foreign debt, whilst the economy was growing rapidly. He also said that Mongolia now needs to separate the commercial and non-commercial operations of the Development Bank, and continue the tight monetary policy. There are some works that have commenced in Mongolia to develop industries other than mining, and to increase the number of products that are being exported. Several participants noted that, unless we produce supreme quality, highly priced products and services, it will be impossible for Mongolia to compete with China in terms of economy of scale. Shizuoka prefecture populated by 3.8 million people is located to the west of Mount Fuji and is ranked in the top ten economies out of Japan's 47 prefectures. The famous firms Suzuki, Honda, and Yamaha are located in Hamamatsu, which leads the prefecture in terms of industrialisation. This prefecture has been working together with our Dornogovi province for five years now. Approximately 20 senior students from Dornogovi high school visit Japan every year to meet Japanese students, live there, and promote Mongolian traditional arts. Also, high school no.5 in Sainshand started teaching Japanese to the public for free. People with disabilities in Mongolia established a Frisbee association and participate in the annual international competition held in Shizuoka. Kitigawa, head of the Shizuoka-Mongolia society of friendship and owner of Kitagawa industries, coordinates this partnership and sees a bright future in the relations of the people of our two countries. Heita Kawakatshu, the governor of Shizuoka prefecture, visited Mongolia three times and arranged for our judo, free wrestling, and cycling contestants in the Tokyo Olympic and Paralympic Games to train in Japan. Only two cities located near Mount Fuji have been highlighted here, but there are many important events taking place in Japan-Mongolia relations and cultural exchanges such as sumo. Japan, Mongolia's essential partner and neighbour, is growing closer and closer. December 21 (gogo.mn) GoGo News Agency names main political events of 2015. In view of the 25th anniversary of the establishment of the State Great Khural and Democratic voting Parliament has approved the Law on Pardoning. Baku, Fineko, December 21 (abc.az) Azerbaijan and Mongolia discussed the prospects of cooperation in the field of civil aviation. CJSC Azerbaijan Airlines (AZAL) reports that AZAL president Jahangir Asgarov has met today in Baku with Tamir Tumurbaatar, the president and CEO of Mongolian Airlines (MIAT). "At the meeting the sides discussed the issues of bilateral cooperation between Azerbaijan and Mongolia in the field of civil aviation and future plans to increase passenger traffic and freight. At the meeting it was noted that the infrastructure created in the field of civil aviation, as well as the favorable geographical location of Azerbaijan, through which the Great Silk Way runs, create good opportunities for the supply of goods through our territory to countries of Europe and the Pacific basin," AZAL informed. According to the Company, following the meeting a decision was made to establish a joint working group to consist of reps of AZAL and MIAT. The group's first meeting will be held next year in Ulan Bator, where we will discuss concrete proposals on cooperation prospects. December 21 (UB Post) The first of a series of breakfast meetings to discuss corporate social responsibility (CSR) was held on December 9, organized by The Veloo Foundation and its volunteers and Success Bridge Consulting. The breakfast series was attended by local organizations which either have an established CSR practice or are starting to implement one. Success Bridge Consulting advises for the Veloo Foundation's fundraising efforts and was a co-organizer of the event. The company helps foreign companies establish operations in Mongolia and get local customers and partners. The event was hosted at U Bean Coffee Shop, which was recently featured on the international coffee culture website Sprudge.com. The coffee shop regularly donates proceeds to charitable causes. Participants in the first CSR Breakfast Series were representatives of MSM, Mobicom Corporation, The Embassy of Canada, Arig Bank, American School of Ulaanbaatar, and The Embassy Residence. The participants discussed how companies both small and large can make a big impact on society through a well thought out and delivered CSR program, how CSR activities improve employee morale and can improve a corporate public image, as well as how to encourage employees to participate in an organization's initiatives. The Veloo Foundation runs a 125-child charity kindergarten, a foster care program, as well as a summer camp targeted to help the children and families currently scavenging in the city's garbage dumps. It is currently developing a community bathhouse as well as a library and a small business development program. These initiatives have been made possible thanks to donations from individuals and companies based in both in Mongolia and overseas. The foundation says that sponsorship and donations from Mongolia based companies have been the cornerstone of the development of their Children of the Peak Sanctuary Project's kindergarten facilities and infrastructure. Wagner Asia Group and Schultz Global Investment were the guest speakers of the event to share their approach to community engagement and their experience at promoting good corporate citizenship. Despite the mining industry downturn and trimming down of their business, Wagner Asia Group reported that it continues its long term commitment to the Mongolian community and has ramped up their CSR effort with a dedicated team who select donation and volunteer causes, conducts the CSR events, and reports on the results of their CSR activities. Wagner Asia Group's CSR program focuses on their mission to "positively contribute to sustainable socio-economic development, employing environmentally-friendly business activities carried out in good faith, working to provide for our employees' needs as well as the needs of our community". Some of the company's past CSR programs include donations of a vehicle and gers to The Veloo Foundation, renovation of an ICU unit of a maternity hospital, as well as land clean-up and construction of a garbage dump for a local community. Schultz Global Investment operates on a "Double-Bottom-Line" principle by "considering impact in the form of job and wealth creation, community revitalization, macroeconomic impact, environmental protection, governance enhancement, knowledge transfer, government revenue support, and sustainable development". The company says it starts its CSR initiatives close to home with professional development training and yoga classes for its employees. Their community initiatives include not only donations to The Veloo Foundation, but they also require socially and economically responsible operations and CSR reports from their investment companies, influencing the spread of CSR in the Mongolian business community. The Veloo Foundation and its volunteers aim to host the CSR Breakfast Series on a quarterly basis, as an advocate of CSR in Mongolia. As a proud CSR partner of its corporate sponsors, The Veloo Foundation says it hopes that through thoughtful leadership and advocacy of good corporate citizenship, more companies in Mongolia will consider partnering with other NGOs and charitable organizations in the practice of good corporate citizenship. Ulaanbaatar, December 21 (MONTSAME) Developmental works of MNT 319 billion will be executed in Ulaanbaatar next year, reports the UB city administration. As of today, the city has received proposals on 530 projects to cost 847 billion Togrog. Expected in 2016 developments include 15 elementary school and kindergarten buildings for 2,700 children, two children's hospitals, a building for police unit, a complex building for khoroo administration, family hospital, police station, and buildings for public service branches in Bayanzurkh, Khan-Uul and Songinokhairkhan districts. Infrastructural developments comprise, 0.9km heat line, 2,500 lighting installations, 8.1km auto-road building, and extensions to 5.4km road. Building of 23 km road will be applied to housing districts. In the margin of the program on development of ger areas and promotion for investment, Ulaanbaatar has been planning to have six suburban centers. The program is costing 320 million USD, to be allocated from the Government, Asian Development Bank and European Investment Bank. Ulaanbaatar, December 21 (MONTSAME) The State Secretary of the Ministry of Foreign Affairs D.Gankhuyag Monday received Mr John Langtry, the Ambassador of Australia to Mongolia. Mr John Langtry has been appointed as the first ever Ambassador of Australia to Mongolia, and he will present his diplomatic credentials to the President of Mongolia on Tuesday. The State Secretary noted that Mongolia views the Australian Government's decision to open an Embassy in Ulaanbaatar as a clear evidence of the high significance it attaches to the bilateral relations. The parties exchanged views on the Mongolia-Australia relations, and hoped that the opening of the Australian Embassy in Mongolia will provide an impetus for further broadening and strengthening the bilateral cooperation. December 21 (gogo.mn) The Foreign Ministries of Mongolia and the Russian Federation held the XIV Consular Consultation in Moscow on December 18th. The XIV Consular Consultation was chaired by the Deputy Director of Consultation Department at the Ministry of Foreign Affairs, E.Batzorig from Mongolia while Director of the Consular Department at the Russian Ministry of Foreign Affairs N.M.Latipov representing Russian side. This time parties discussed and exchanged their views on implementation of visa-free travel agreement between citizens, mutual protection of rights and legitimate interests of the citizens, coordinate the activities of border control agencies and consular relations. December 21 (infomongolia.com) Last Friday night, Mongolian military servicemen from the 2nd shift of the "Resolute Support" (RS) mission in Afghanistan, commanded by Lieutenant-Colonel N.Erdenebayar, returned home after completing their mission in collaboration with the German Armed Forces. Representatives of the General Staff of Mongolian Armed Forces and the Ministry of Defense of Mongolia welcomed the peacekeepers at the Chinggis Khaan International Airport in Ulaanbaatar. The "Resolute Support" or "Operation Resolute Support" is a NATO-led training, advisory, assistance and counter-terror mission consisting of 12,500 soldiers in the Islamic Republic of Afghanistan, which began on January 01, 2015. It is a follow-on mission to the International Security Assistance Force (ISAF) which was completed on December 28, 2014. December 21 (gogo.mn) State Honored Artist and opera singer G.Ariunbaatar appointed as Culture Ambassador for Mongolia and Speaker of the Parliament Z.Ennbold handed the certificate. December 21 (gogo.mn) 24th World Memory Championships was successfully held in Cheng Du city, Sichuan the most legendary and historical place of China from Dec 16-18. 278 competitors from more than 25 countries have competed in ten different disciplines for three days. Moreover, Grand Master E.Purevjav became Junior World Champion by its total scores while E.Enhmunh placed 2nd and Asian Master Z.Tsetsegzul placed 3rd. Junior athletes won 22 medals out of 30 medals. Grand Master E.Purevjav and E.Enhmunh qualified for International Grand Master and became the best 10 competitors. B.Shijir-Erdene qualified for Grand Master while T.Enhjin, N.Tuvshintugs, B.Ariunsanaa, B.Hangai, E.Yalguun and A.Nomin qualified for International Master. Congratulations to all athletes showed great success in result of many days of preparation. Interestingly, Mongolian Intellectual Academy have competed for 35 competitions and won total of 484 medals for last five years. Ulaanbaatar, December 21 (MONTSAME) A three-day training themed "Evaluation of job places and method of fixing salary size" was organized last week in the Ministry of Labor under auspices of the International Labor Organization (ILO). Aimed at creating the most proper mechanism of salary system and its regulation in entities and organizations, at establishing wage agreements in the mining and construction sectors, the training also gathered Yong Moo, a chief expert on labor relations at the Beijing-based bureau of the ILO; Nu Gwang Pyu, a director of South Korea's Institute of Labor and Social Relations; and Li Jongsu, a researcher. They delivered reports on the salary system, its evaluation, the wage systems based on skills and job places, and methods of evaluating job places. Among the participants were also economists in charge of salary affairs from the biggest companies of construction and mining industries, representatives of some Ministries, the Trade Unions of Mongolia, scholars and researchers. The training attached an importance to making the salary system more proper, setting up standards of granting salary based on professional skills, reducing a gap between wage sizes, improving the evaluation process of job places, making it more realistic. December 21 (gogo.mn) Snow storm to hit Western and Central aimags today, spreading to other aimags in further and to bring snow and cold. Specifically, snow and snow storm is expected at Western and Central aimags on Dec 21, Western and Central aimags as well as northern parts of Eastern aimag on Dec 22 and Eastern aimags on Dec 23. Winds will reach 14-16 m/s in most regions on Dec 21, 22, Gobi region on Dec 23 and Eastern region on Dec 24. Darkhad hollows, Huren Belchir, Ider, Tes, Haraa, Yuruu, Tuul, Terelj, Herlen, Onon, Ulz and Halh river basins to see night temperatures to drop to 33-38C below zero, 23-28C at day. Night temperature at Southern parts of Gobi region to expect 19-24C below zero, 9-14C at day while night temperature around other region will be 26-31C below zero and 16-21C at day. New York, December 21 (Reuters) Hollywood actor Nicolas Cage has agreed to turn over a rare stolen dinosaur skull he bought for $276,000 to U.S. authorities so it can be returned to the Mongolian government. "Each of these fossils represents a culturally and scientifically important artifact looted from its rightful owner," Bharara said last week. December 21 (gogo.mn) With the goal to enhance artistic partnership between Mongolia and Switzerland, support successful Mongolian talents abroad and to promote Mongolian artistic excellence to local and international audience the Arts Council of Mongolia (ACM) is presenting "Aquafire" contemporary dance production on December 24, 2015 at the Corporate Hotel & Convention Center. "Aquafire" is the first Swiss and Mongolian and American joint dance production that raise eternal questions of humanity - men and women through the presence of two different nature water and fire, their mutual understanding and disagreement. The production explores patriarchy, idealist and democratic values of men and women and how each society perceives gender equality and the changes our stereotypes about a man and a woman associated with our cultural identity. ACM has invited a young choreographer and dancer of Hedwig Contemporary Dance Company based in Chicago Odbayar Batsuuri, music composer Purevsukh Tyeliman, film maker Ikhbayar Shagdarsuren, Swiss trumpets Matthieu Mitchel and American stage and light designer Barry Steele and ballerina of State Opera and Ballet Theatre Ganchimeg.Ch to create a unique, cutting edge, competitive production set to a video art and music by contemporary dance. The production consists of three mains parts including 'Fire dreamed of aqua', 'Aqua falls in love with fire' and "Aquafire" dance pieces to set live music and video art. For more information please call 319015, 319017 and visit ACM Facebook. December 21 (UB Post) Mongolian ethno-jazz band Arga Bileg was selected for a Swiss-Mongolian joint music production dedicated to the 50th anniversary of Mongolia-Swiss diplomatic relations. Arga Bileg's "Agula" album, released earlier this year, has been nominated for the 2016 Grammy Awards. The following is an interview with member of Arga Bileg and A-Sound and pianist T.Purevsukh about this project, upcoming albums and career. The recently released "Agula" album has been nominated for a Grammy Award. Can you tell us how this came about? This must be a huge honor? Arga Bileg worked with many people. We registered our composition in the World Intellectual Property Organization and now, we're trying to promote it in the global market as it is a collaboration project with Switzerland. This kind of opportunity doesn't come often to Mongolian artists. Many talented Swiss and Mongolian musicians worked on with us. There are many things Mongolian artists can learn from Swiss artists' playing method. I believe that the project was very fruitful as we gained abundant experience while working with foreigners. Earning nomination for a Grammy Award is an achievement and a breakthrough for us. I've never heard of a Mongolian artist being nominated for a Grammy Award. Are you receiving many collaboration offers? The Arts Council of Mongolia (ACM) sent videos of Mongolian bands to the Swiss side and Arga Bileg was chosen. The ACM was highly professional in carrying out the cooperation agreement and registering our compositions to the World Intellectual Property Organization. The ACM planned out our schedule a whole year beforehand. We rehearsed for four days, played for two days, and recorded our album in five days. If I hadn't worked in the Agula project, I probably wouldn't have been able to compose the music for "Usgal" ballet, a modern dance play to be showcased soon. "Usgal", which will be performed starting December 24, portrays the nature of existence of men and women. In your opinion, what is the biggest difference between men and women? December 21 (The Independent) This was surely the ultimate answer to armchair travel. Moving through a fantastical landscape of sand dunes strikingly corrugated by the wind, I gloried in bizarrely comfortable transport. Camel-back had not previously struck me as offering scope for hedonism but then I'd never before taken a trip on a bactrian camel. Sitting snugly between the double protrusions on the back of one of these weird-looking desert victors, you feel as if you're being carried on a cross between a snoozy old sofa and a shaggy magic carpet. As I gazed over to a mirage, shimmering like a fairy-tale lake in the distance, I thought of those iconic camel riders celebrated every year on Christmas cards: what a pity the Three Wise Men apparently travelled on dromedaries, perched atop the one awkward hump of those large-eyed ungulates. Bactrian camels would have been wonderfully deluxe alternatives. I was in the Gobi Desert, sole preserve of the two-humped creatures, taking in a micro-slice of this amazing expanse of sand, mountains and sparsely vegetated plains with a camel herder called Erdene. About twice the size of France, the Gobi encompasses a big chunk of northern China's provinces of Xinjiang and Inner Mongolia, as well as the southern belt of independent Outer Mongolia. Erdene and I were in the latter region (indeed "Gobi" effectively means "desert" in Mongolian), in the Moltsog Els dunes, a regular summer base for the herds of Erdene – a nomad like most Mongolians, he retreats to the shelter of the nearby Altai mountains during the bitter, windy months of winter. Erdene gave me a Mongolian nomad's big-hearted welcome, ushering me into his ger, a circular, yurt-like tent of a home, and as is the custom, presenting me with a snuff bottle to sniff and lip-puckering fermented camel's milk to drink. Then, donning his flamboyant herder's hat topped with a golden spike, he strode out to his animals, saddled up and we set off for our morning's excursion. The surreal world of the Gobi looked ever more spectacular from the vantage of a cosy camel – whose mutterings and imprecations added a moody soundtrack. I had arrived in Mongolia a couple of days earlier, starting my trip in the capital, Ulaanbaatar – commonly known, without those daunting vowels, as UB. Throughout my Cold War-dominated childhood, Soviet-controlled Outer Mongolia had seemed as inaccessible as outer space. In 1990, the Russians withdrew from the country and multi-party democracy was established, since when Mongolia has opened up, with tourism gradually increasing. Wealth, too, probably rather more swiftly: post-Soviet Mongolia has (largely) thrived thanks to its mineral resources and to its free-market mining activities. Nowhere is this more evident than UB, now a rich and strange mix of temples and shopping malls, skyscrapers and timeless-looking gers. It contains about half the three million population of this enormous little country, and its remnants of the Russian era range from an opera house presenting superb classical music and ballet, to billboards in Cyrillic script which is still the national alphabet. Underlining Mongolia's growing stature as a place both for business and for upscale (if off-beat) travel, the first major five-star hotel in the country opened in June. The 21-floor Shangri-La, complete with magnificent lobby, ballroom, two much applauded restaurants and 290 spacious bedrooms, makes a sleek base from which to explore the city. I spent an absorbing morning visiting the glorious Gandan monastery, one of the few Buddhist establishments to survive (by a whisker) the Soviet purges of 1937. Meanwhile, the National History Museum engagingly distils Mongolia's heritage, from the Hunnu Empire of 3BC and Genghis Khan's 13th-century victories to the present day. I ended my city tour at the dinosaur museum (Mongolia is eye-poppingly rich in fossils), which is intriguingly set in a shopping mall otherwise lined with chic stores selling stylish cashmere products – the country is the world's second largest producer of top quality goat wool, after China. Visually, Mongolia is very weird and very wonderful in both town and countryside. Yet because people here are remarkably genial and open-minded, visitors rarely feel culturally dislocated, instead enjoying a tremendous sense of warmth and hospitality. I was fortunate, too, in travelling with one of Mongolia's most environmentally and socially sensitive companies, Nomadic Expeditions, which was founded as the country was establishing its brave new world of democracy, and has done much to pioneer tourism. My guide, Anand, enlightened me with captivating insights such as how Mongolian women have for centuries enjoyed equal rights, and how a ger is so well designed it can usually withstand winds of more than 60mph, despite being principally constructed of felt. "From five-star hotel to 5,000-star sky," Anand remarked with a grin on our short domestic flight to the Gobi. Arriving at tiny Dalanzadgad airport, we jumped into a waiting 4x4 and set off across a beautifully, eerily open landscape, a dance of sky and clouds emphasising the enormously wide perspective and producing ever-changing bands of colour. Solitary round felt tents and distant herds of horses, cows, sheep and goats appeared and then melted into the horizon as we drove about an hour and a half to Three Camel Lodge, an encampment of gers (each now with its own bathroom – a new development) which was set up in 2002 by Nomadic Expeditions. They have developed their own solar energy here; they employ and train locals from the nearby oasis village of Bulgan – and provide a ready market for their vegetables; and they have been particularly astute over the choice of location. The encampment lies in the shelter of a small volcanic outcrop and has two wells on its land. Local herders are welcome, so there's a constant visual feast as animals are driven to drink here throughout the day. Anand explained that the scrubby grasses covering the plains in this part of the Gobi are rich in minerals and make particularly good grazing. On my first evening I watched the antics of about 30 horses against a pinkening sky, and in the ensuing darkness I made out at least some of those 5,000 stars (the Three Wise Men would have been navigationally challenged in the Gobi). That night, I fell asleep to the gentle sound of equine snorts outside. If you can tear yourself away from watching the natural ballet of hoofed herds moving in and out of view in front of the encampment, there is plenty to do here, quite apart from taking a tour on a bactrian camel. We drove to Havtsgait valley, about half an hour away, and hiked vertiginously up to a series of phenomenal rock drawings, the work of early settlers 15,000 to 40,000 years ago. As I examined the petroglyphs of outrageously long-horned goats, I caught sight of a trio of camels looking just as wondrous far below us. Later, we made a sunset visit to Bayan Zag, an escarpment also known, with much justification, as the Flaming Cliffs because of its glowing colour, particularly in the early evening light. In 1923, fossilised dinosaur eggs were discovered here by the American adventurer and naturalist Roy Chapman Andrews, said to have been the inspiration for Indiana Jones. Yet perhaps best of all, we went to school. My trip to the Gobi took place at the start of the Mongolian academic year, which is marked with gusto across the country. At Bulgan village, children arrived at school immaculately dressed, some small girls with white bows in their hair, some small boys sporting polka-dot bow ties. They sang the national anthem and raised the Mongolian flag. Juniors played the Mongolian horse head fiddle; seniors gave a display of break-dancing. The atmosphere of enthusiasm was palpable. How much more sensible to celebrate the beginning of the learning process rather than the release from it, as we do. You learn a lot from the wise men and women of Mongolia. Nomadic Expeditions (00 976 11 313 396; nomadicexpeditions.com) offers tailormade packages to Mongolia – a seven-day holiday costs from US$5,195 (£3,463)pp which includes three nights in Ulaanbaatar, a night spent camping at the Gun Galuut Nature Reserve, and three nights in the Gobi Desert. Ground transport, excursions, entrance fees, and most meals are included. Domestic flights to Dalanzadgad, in the Gobi, are extra at around US$420 (£280) return. International flights not included. Shangri-La Ulaanbaatar (00 976 7702 9999; shangri-la.com/ulaanbaatar) has doubles from US$240 (£160), including breakfast. Three Camel Lodge (00 976 11 313 396; threecamellodge.com) has double rooms from US$600 (£399). The easiest way to reach Mongolia is via Beijing, served non-stop from Heathrow by British Airways (0344 493 0787; ba.com) and Air China (020 3275 0200; airchina.co.uk). Onward flights to UB are offered by Air China and Mongolian Airlines (00 976 11 333999; miat.com). No visa is required for British citizens.